Want a real way to keep ants away from your picnic? Eat them. No, not those tiny little walking black dots that get lost in the folds of the picnic blanket. To truly get their attention, you need to gobble up their leaders like you’re Andrew Zimmern. These Giant Toasted Leafcutter Ants from ThinkGeek are just the thing. 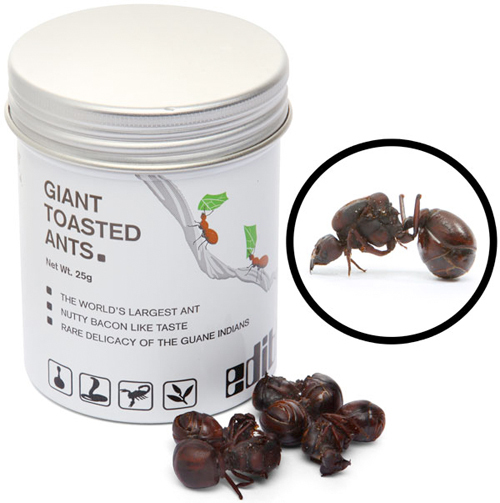 Real, edible ants, toasted just for you and put in a jar—just like any other snack. Each ant measures about an inch long and are said to have a nutty, bacon-like taste—a perfect compliment for the cold fried chicken and potato salad.